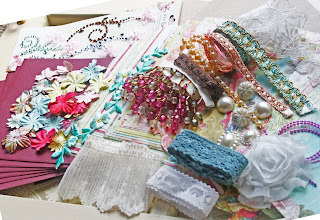 It's time for a Crafty Challenge Piece by Piece Style! We know that the time for May flowers has passed, but the sun has just started to shine here in California and we want to see how you can bring life to a trio of flowers made with trim, lace or fabric! Get out your supplies, whip up your unique signature flowers and share them with us to enter the challenge and be eligible to win an awesome prize from The Piece By Piece. Who can play? : The challenge is open to you, your friends and your mother! Seriously, this challenge is open to everyone! When is the play time? : You get the entire month of June to play and submit your June Flowers Challenge entry. June 30, 11:59 PDT is the official deadline. Winners will be selected and announced during the first week of July. Where do I play? : Submit your challenge entry by using the Mr. Linky in this post. Your submission will be judged on its level of uniqueness and creativity, so break out your mad flower making skills. You can use the flowers in any type of project, or just submit the flowers on their own. The Piece by Piece Design Team will select two winner and the winners will be announced during the first week of July, The winners will receive an awesome prize below from Bev at The Piece by Piece. Have fun playing. We look forward to seeing how you use your creativity on this challenge. 2 Winners will receive the Prizes Below! i've seen your work, Juliana, looking forward to seeing what you create! Can we enter more than once ? Gisele, We are taking one entry per person on this challenge. Thanks for asking and we look forward to seeing your floral creation. Me to, Lisa. Can't wait to see what you come up with for the challenge. I hope I entered correctly I created a blog and used Mr. Linky! If you dont find my entry could you please let me know..Thanks! Hi Char, I see your entry and the June Flower post on your blog. Thanks for taking the time to enter and good luck to you. Hi! Thank you for offering this challenge. I posted my flowers on my blog and hope you all enjoy them! Just Added my entry today! I hope I did it correctly. If not here is a link to the photo of the flowers. Thank You for doing this fun floral challenge. Hi Terri! You totally did it correctly! Thank you so much and good luck to everyone! Hi! That was a fun challenge! So many gorgeous flowers by everyone! Thanks so much for hosting this! I am not sure where to check for the contest update.? Everyone's flowers are amazing, I imagine this will be a tough one! Thanks again girls! Tammy Ozuna Designing for TPBP!